Just inside the entrance of Fat Choi hangs a meter-tall photo of a many-armed statue of Guanyin, the Buddhist Goddess of Mercy. Iana, the daughter of Fat Choi’s founder, Silvana Assumpção, took the photo in a hotel in Macao, the infamous Chinese port and sin city. She then photoshopped out the hotel scene in the background and added bright fluffy white clouds. Macao hotels show up in posters elsewhere in the restaurant, along with a backlit aquarium with choose-your-own tilapia. 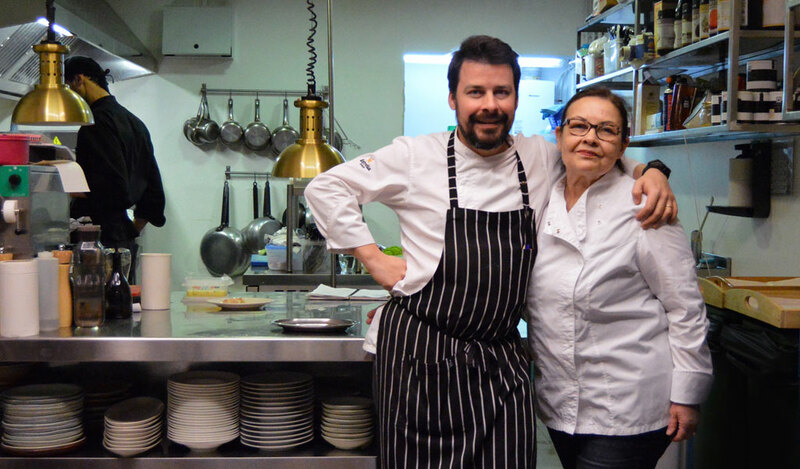 That penchant for play and cultural appreciation is what fuels the kitchen at the two-month-old restaurant. Silvana, who is 41 and a physical therapist, started Fat Choi (a Chinese greeting that means “prosperity” and well-wishes) as a pet project to introduce Macao to the cariocas. 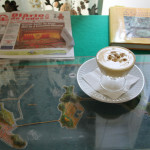 Customers often ask her whether Macao is in Africa or the U.S. Her cooks haven’t had training in Asian cuisines, so on one occasion she had to run several blocks from her physical therapy office to kill a fish at the restaurant and then run back. 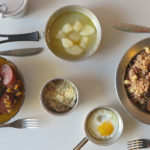 According to Silvana, the origin myth of her native cuisine goes something like this: A Portuguese settler turns to his Chinese wife and says, “Make me some cozido,” a stew of meats and vegetables. His wife, in turn, spices and cooks it with her own ingredients. 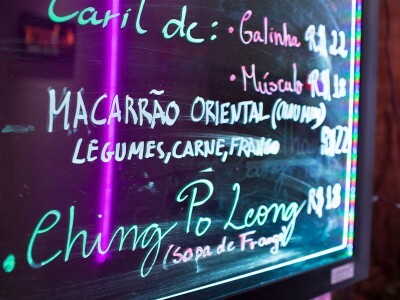 “The Portuguese man says, ‘This isn’t cozido, but I like it!’” The food of Macao is 90 percent Portuguese and Cantonese, Silvana says. And the rest comes from the travelers who would pass through the port: African, Indian, Malaysian, Thai. 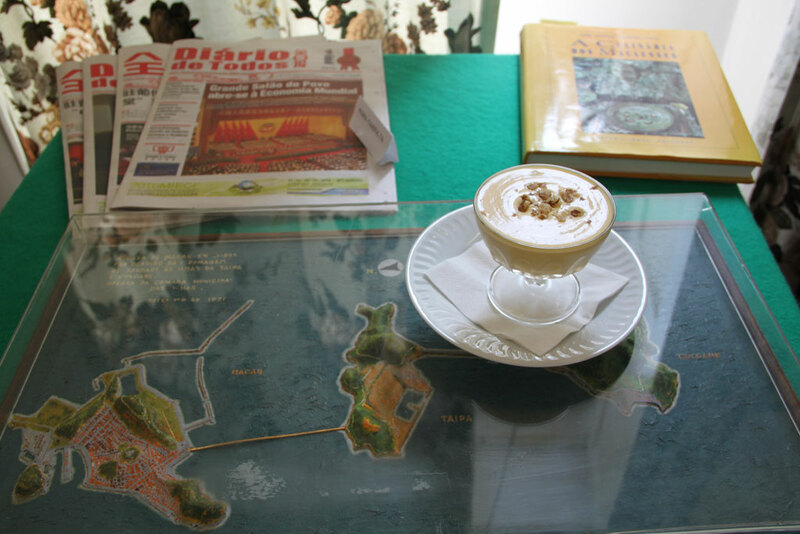 The Macanese make minimal use of salt or frying, which Silvana feared wouldn’t appeal to the decadent carioca palate. 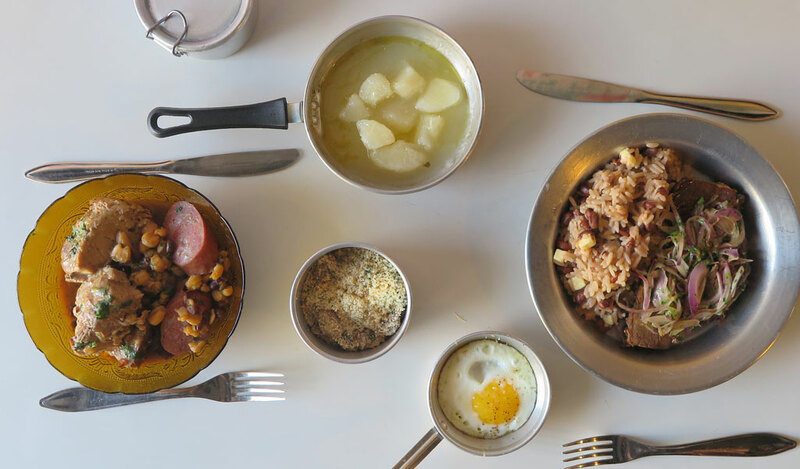 That’s not to say that Macanese cooking is austere. A typical dish is the bafassá, pork shank marinated for 12 hours in wine, saffron and coconut milk. The name comes from patuá – “bafa” from abafar, which means to smother (a reference to the marinating) and “sá” from assar, to grill, which is how the pork is finished. The galinha africana shows the diverse roots of Macanese cuisine, a chicken in a rich, savory wine sauce made with coconut oil, peanut paste and onion. The si chiu pai kuat, or costelinha de porco com feijão, a pork rib in oyster sauce , red bell pepper and hot pepper, bursts with spice and flavor. (Parts of the menu are bilingual.) 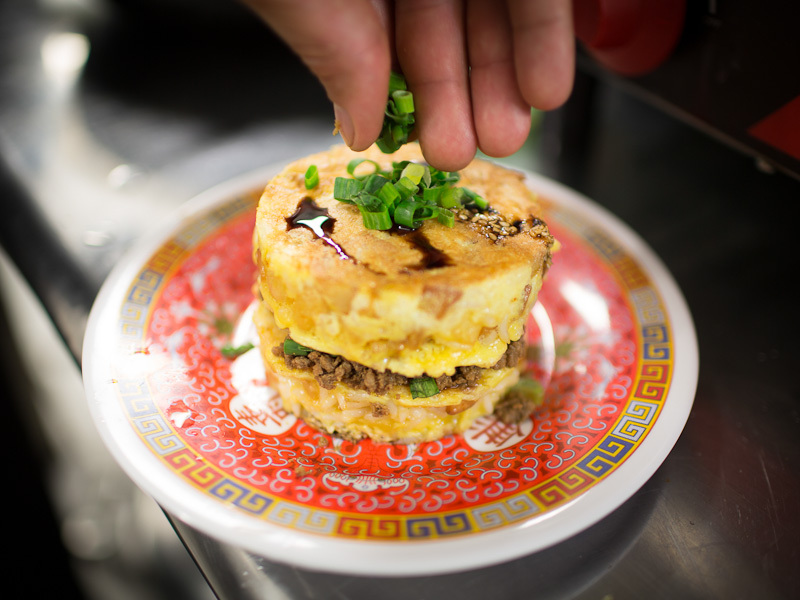 The Sanduinchi is not on the menu, but regulars know to order Fat Choi’s version of a sanduiche: savory ground beef within a “bun” made of egg and potato. 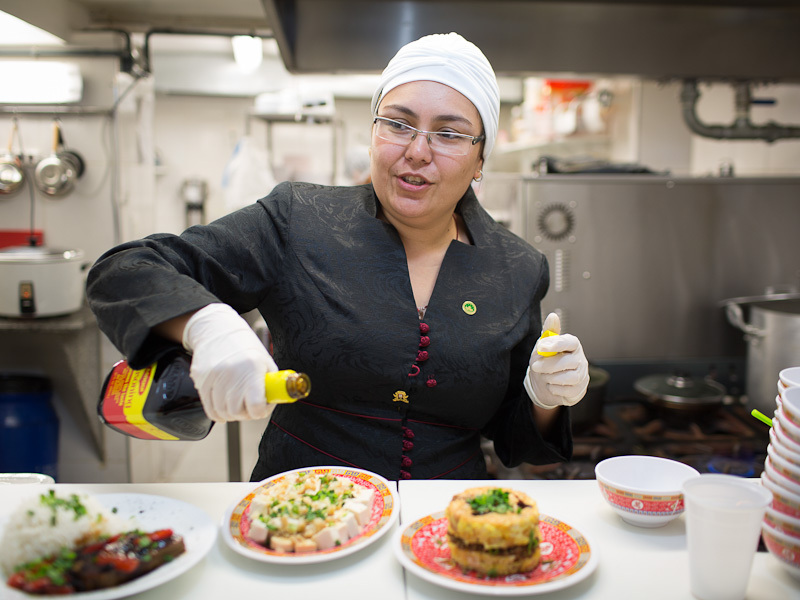 Silvana says that Macanese cooking is hard to find even in Macao. 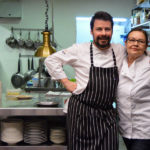 While sophisticated restaurants have moved on to international cuisine, just a few establishments serve the port city’s traditional food. You find it, she says, in the homes of Macao’s deeply rooted families – in that city or as far away as Rio. 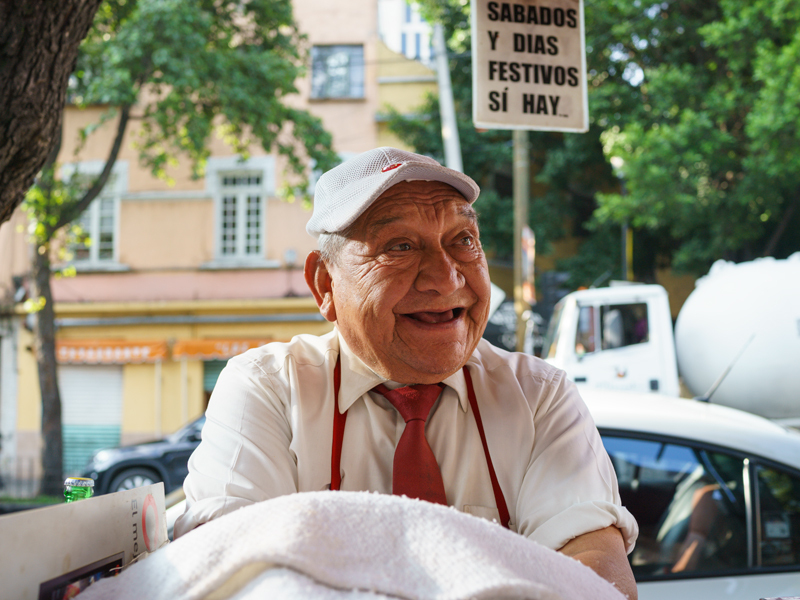 Silvana’s father didn’t expect cariocas to like the exotic flavors and strange ingredients of macaense cooking, but Silvana says she has already been surprised; the caldo de pé de galinha com amendoim (chicken’s foot and peanut soup) has been a local favorite. 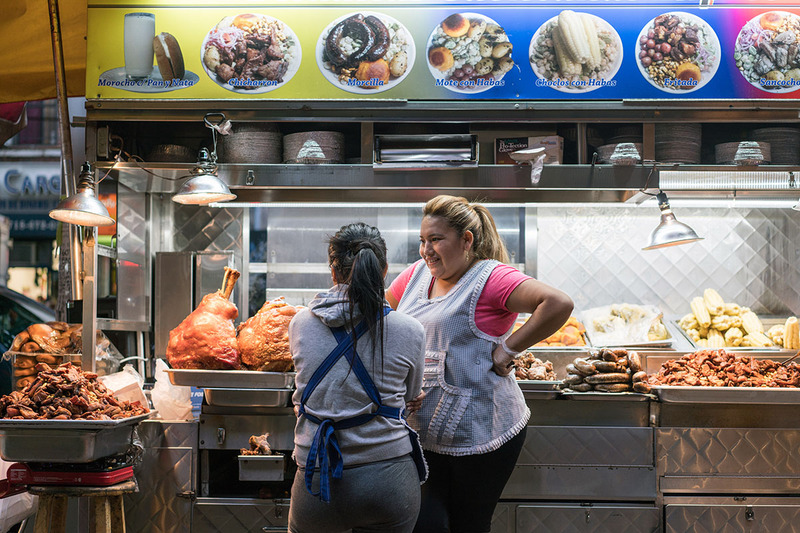 “I wanted to show my roots,” says Silvana, though we suspect that Fat Choi’s menu of dishes that smack of Africa, Europe and Asia will still leave locals wondering just what those roots are.